Students at Cal Poly said they were outraged by images of one student in blackface and others in gang-style poses. 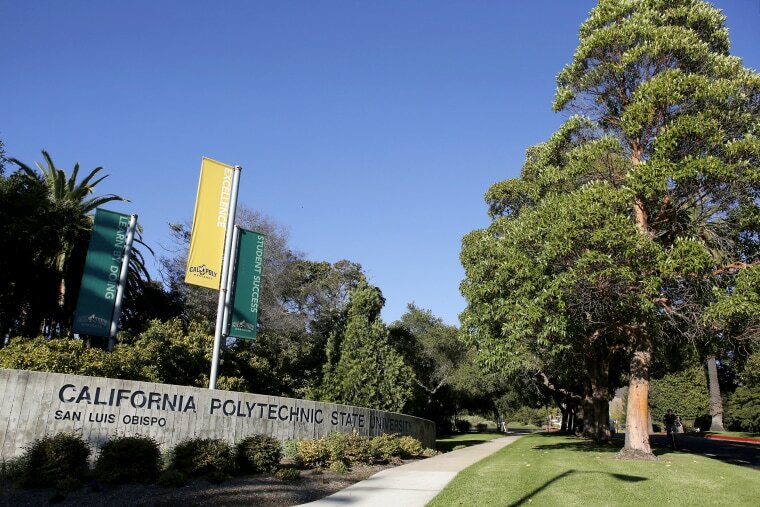 LOS ANGELES — A fraternity at the California Polytechnic State Institute was suspended by both its national organization and the university this week after images of a member posing in blackface and other members assuming gang-style poses were circulated on social media. The images surfaced as the university, in San Luis Obispo, celebrated a multicultural weekend on Saturday and Sunday. Administrators reacted by putting the fraternity in question, the Phi-Sigma chapter of Lambda Chi Alpha, on interim suspension on Monday. The images outraged students. "I don't know how you can paint your face black and say it was a party theme," student Norris Cooper told NBC News affiliate KSBY. "It doesn't feel like diversity and inclusion is important. I'd like to see diversity. I would like to see people that look like me on campus." The university said the photo-taking event, which apparently took place outside the Phi-Sigma house last weekend, was under investigation. President Jeffrey D. Armstrong said in a statement that the images represent "senseless acts of ignorance that injure and alienate valued members of our community." "They must stop," he said. "We may come from differing backgrounds, but every one of us at Cal Poly is a human being who deserves respect. In the most important ways, we are one family." On Wednesday, Lambda Chi Alpha suspended the chapter until April 29, according to a statement. The organization said it has begun its own inquiry, and the two top chapter leaders and two other members have resigned from the fraternity. National spokesman Taylor Grayson said one of the resigning members was the student pictured in blackface. A campus demonstration against the chapter's actions is scheduled for 8 a.m. Friday, a day when the school holds its annual open house for freshman. A multitude of school organizations that represent minority students condemned the actions portrayed in the images. The Black Student Union said in a statement that the incident "undermines the attempts by student organizations to increase the numbers of students of color and instead perpetuates the cumulative, hostile environment for marginalized students." Students spoke out during a Monday town hall on the imagery, with some accusing the university of being reluctant to take action. Student Matt Bowers told KSBY that the school needed "more awareness about what diversity actually means to people and how people can really be affected."